Double Daring Books for Girls (Challenge) Book Shower! I am thrilled to be a participant in a book shower for the authors of the new Double Daring book for Girls! 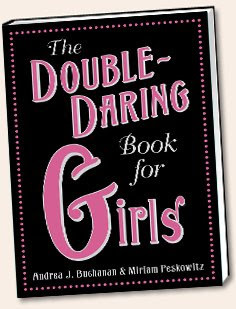 Andrea J. Buchanan & Miriam Peskowitz have compiled a whole book of double daring adventures, crafts, stories, sports and knowledgeable facts to encourage all those daring girls to put themselves to the challenges. It is a great book to learn new things, and try your hand at the activities and crafts! Even my son had a kick out of the Math Tricks and used them to stump his peers and his teacher. The Double Daring Book for Girls is a follow-up to the bestselling book: The Daring Book for Girls, and has all new material. Girls will learn how to play football, catch a fish, make a labyrinth, learn about the Chinese New Year, how to make a scarecrow, what words impress, the Nobel Prize, learn about the origin of phrases and idioms, being a detective and much more! I have really enjoyed reading this book, and some of the contents brought me right back into my childhood days, and the fun things my friends and I did and learned about. I think the Double Daring Book for Girls makes for a great book for any homeschooling family because you can use so much of the information and activities in your studies. Did you know that you can learn how to paint a room, how to build a raft, make antique paper, how to make a rope ladder, and learn about the history of the bicycle....all found in the Double Daring Book~ Plus so much more! I was asked to host a dare on my site to help promote this great book, and also participate in the book shower for the authors. So, I thought it would be fun to make our own piñata out of papier-mâché as something to dare my readers to do, but instead, I have decided to make a snow globe. I know winter is over, but who says it is too late to make a gift for someone. I personally love homemade gifts, and love to give them to people. So, I am daring you, my readers, to make a snow globe. I will give you the directions that are in my Double Daring Book, and you can make one. I would love it if you could post this on your site, link to me, and let me know you did it. I think it sounds like fun! I will work on my globe this week. I am actually going to ask my 10 year old son to make one with me. (even though he is NOT a girl). I will post the picture later this week of what my globe looks like. What a fun craft, huh? The Double Daring Book for Girls is packed with such fun craft ideas! *Optional: glycerin, to make the water a bit thicker so the glitter moves slower. First, glue the doodad to the lid of the jar with the glue of choice. Modeling clay will even hold the doodad. Set aside to dry fully, and make sure it is really sticking. Then, when the glue is dry, fill the jar most of the way to the top with cold water, leaving some room for air. Add a few teaspoons of glitter and *glycerin*. Close lid tight, and shake. Once you have the right amount of water and glitter, take the lid off and dry well. Put some glue on the inside of the lid, and glue it tight to the jar. You can hold it with clay, too. Allow the whole thing to dry before shaking. That's it! Doesn't it sound like fun!? I think you should make a snow globe with me! 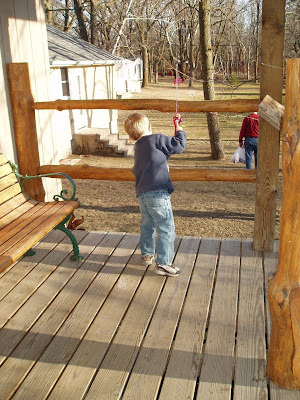 Your kids can really have fun with this project, too! Daring is all around us. It is in girls who break barriers and girls who help out friends. It is in girls who scale mountains and girls who speak their minds. It is in girls who make things and girls who ask questions, girls who set their sights on adventure and girls who find adventure in their own backyards. Daring is about finding your journey and following your dreams—getting off the sidelines and getting in the game, whatever your game may be. So fire up your inner daring, turn the page, and remember the daring girl credo: Enjoy yourself, learn new things, and lead an interesting life. So, you have been officially DARED!! Will you take the challenge and join me in making a snow globe? Baby Bunch has such creative and fun gift sets to offer for special occasions. I have been thrilled about all of their products and I get so excited to let others know about them! They recently just came out with their baby nest eggs! I love this set and I am excited to share it with you! You will find 3 little "eggs" sitting in a nest. You can choose either 3 pink eggs or 3 blue eggs. These "eggs" are actually 3 pair of organic cotton baby socks (0-6) month size. Sitting on top of the "eggs" is the mother bird, which is a spice-scented sachet for your dresser drawer. I love the creativity of baby bunch, and I can highly recommend checking out their site for all the products they offer. I am sure you will find a great gift idea for a new mom for her baby, welcome baby gift, or gifts for moms or friends(like the garden set, spa set, or the kitchen set). The nest (eggs and bird) are wrapped in plastic wrap, tied with a ribbon, and has a birdie gift tag for personalizing your gift. Retail price is $19.95. I think this set came out at the perfect time! Spring is in the air, and so are the nest eggs! From executive producer Rick Eldridge (the award-winning family feature The Ultimate Gift) comes the heartfelt drama Dog Days Of Summer. Eldridge, CEO of The Film Foundry, creates a poignant masterpiece centering on the discovery of truth and a journey of restoration. Dog Days Of Summer debuts on DVD April 21 from Anchor Bay Entertainment for the suggested retail price of $19.97. Obie Award-winning actor Will Patton (A Mighty Heart, Remember the Titans) stars as Eli Cottonmouth, a stranger who captures the attention of two boys and leads them on a journey that soon begins to uncover the secrets of a quiet southern town. As Eli recreates the true essence of the community by building a miniature model of the city, the boys are shocked to discover their town isn’t as perfect as it seems. The film includes supporting performances from Richard Herd (“Seinfeld,” “Star Trek Voyager”), Devon Gearhart (Changeling), Colin Ford (“Journeyman,” Push) and R. Keith Harris (Junebug, The List). 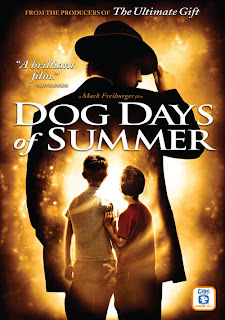 Shot entirely in historic Edenton, North Carolina, DOG DAYS OF SUMMER was produced and directed by first-time helmer, Mark Freiburger, and was based on an original screenplay by Travis Beacham and Christopher J. Waild, all 2005 graduates of the North Carolina School of the Arts. Dog Days Of Summer, which has garnered The Dove Family Approved for 12+Seal, includes “The Dark Room” bonus featurette. A perfect town. Or so it seems. Then one summer, a mysterious stranger arrives with a simple proposition and a powerful secret. The newcomer, Eli Cottonmouth, bewitches the townsfolk with his charm. His intentions concern the town fathers, and his secrecy captivates two curious boys. As Eli recreates the true essence of the community by making a miniature model of the town, he uses the boys as his eyes and ears to gather information. Armed with his ancient camera, they snap pictures of small town life. With each new photo, Eli changes the way the boys look at their town. Their childish wonderment is shattered as the boys' eyes are opened to what’s really happening. Eli's hidden agenda shocks the townspeople and threatens the existence of the entire community. TWO people will each win a full set of five No-Cry Solution books – autographed! You can keep them for yourself, give them to a friend, or hold your own give-away contests on your blog or website! Quote it on your blog, website, newsletter, or Facebook page. That’s all ~ you’re entered! Winners to be chosen at random on July 15, 2009. Thomas & Friends: Live On Stage! The beginning of May, our family went to the Thomas & Friends Live! on Stage: A Circus Comes to Town, thanks to MomSelect for the tickets! I was chosen to receive four (4) comp tickets in the mail, and was able to pick the time and location to the Thomas & Friends show that our family wanted to attend. Here is our family outside the Target Center getting ready to go inside. Dad with the little ones. Nathaniel opted out of this show. He is 10 1/2, so Thomas isn't something he is very interested in anymore. Here is the stage before the show. Madelyn loved having popcorn with Dad. She had fallen off of a chair backward before the show, so she was a bit sad. She didn't let a chair ruin her evening, though. This is a picture of Sir Topham Hatt with the train engineer. They were singing a song together. I liked that this show was a musical. It was fun hearing new songs, and seeing the characters come alive. The show is about Thomas making a big mistake and how all the engines on the Island of Sodor must work together. Everyone is preparing for the big event under the Big Top, and Thomas must prove he's a really useful engine once again. There is exciting adventures along the way, and meeting more people (townspeople from the Island of Sodor). Percy, James, Gordon, and Thomas join Sir Topham Hatt to welcome a colorful cast of circus performers in an engaging story that demonstrates the importance of friendship and cooperation...especially when Thomas is in trouble. Here is the circus car, along with 3 of the circus cast: trapeze artist, strongman and the clown. Here is a picture of three characters singing in the rain. This was a fun part, the strongman was twirling the trapeze artist, and she went up high in the air. It was a great show, and my kids are wanting to go again! Thank you MomSelect for the wonderful family outing...and memories made. We were fortunate to go with some friends of ours, and their two children. It was a great evening and lots of fun! 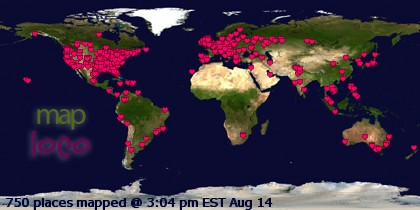 For times and locations of a Thomas & Friends show near you, visit the Thomas & Friends event page. I think that cloth diapering is such an economical and safe way to diaper your baby. Parents can save so much money if they cloth diaper, especially if they have more than one child. I was asked to review Happy Heinys, which is a USA made company ran and operated by Linda Byerline. She started the business with her daughter, Sarah, wearing the Happy Heinys. She wanted to start a business that she could run from home, reaping the benefits of a stay at home mom. The quality of the diapers is super! Happy Heinys are specially hand sown by dedicated seamstesses. I like knowing that the diapers I received were made by someone and not a machine. I got an orange and blue One Size Pocket diapers. With each diaper, is 2 micro fiber inserts: One small and one large insert. You may use either 1 insert or both or more as needed depending on how heavy your little one wets. I think this is a great concept, because all children vary in their bladder size. There is plenty of room to add the inserts, and the flap closes well over the inserts. Happy Heinys also carries hemp stuffins, which also fit well into the one size diapers. One Size diapers are available in 22 different colors and several different prints. The fabrics have been tested to last up to 12 hours at night for most babies. Happy Heinys uses only custom milled fleece for their diapers. There are no leg casings, which make better fitting diapers and contain messes better without leaving red marks on your baby's legs. 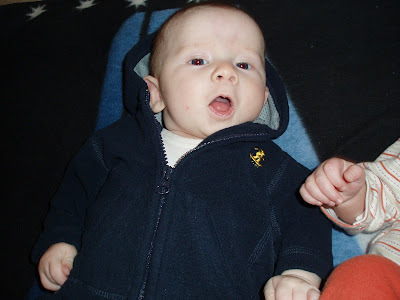 They are designed so the only thing that touches your child's delicate skin is the soft fleece. Happy Heinys are available in a variety of solid colors and fun prints. Happy Heinys solids and prints have been tested for 12 hours or more at night with absolutely no wicking for most babies. The solids have a 100% poly laminated outer layer and will work better overnight. The prints are now custom made for us with the same fabric as our solids diapers in order to reduce leaking and wicking. Happy Heinys pocket diapers come in several different styles. Pocket diapers with Aplix brand velcro tabs or you can also have optional snaps added to the tabs for "extra security". Once your baby gets a little older, they may try to pull the velcro tabs open so we've added the optional snaps to combat the issue. Our pocket diapers also come in a one size fits all style. 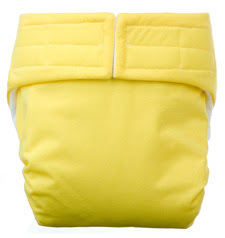 You can choose from the Aplix tabbed One Size Diaper or the Snap tabbed One Size Diaper. The snaps version is our newest release and quickly becoming a favorite. Happy Heinys One Size Pocket Diaper has won the iParenting Media Award! Award-Winning One Size Reusable Diaper! Happy Heinys have also been featured on TLC and Time. I think that the Happy Heinys are a great cloth diaper for your baby, and I am so happy that these diapers are made in the USA by moms who care about our babies! Barbie has gone "Green" in the celebration of Earth month (April) by creating an eco-friendly packaged product line up and eco-themed toys. I was excited to review a few of the eco-friendly Barbie products, and share them with you. person can make a big difference. This was a cute movie, with a good message. I thought that some of the language between the characters was a little demeaning at times. I think this movie is geared toward the older kids (ages 7 and up) just because of how the girls talk to each other. However, the message is that Makena is spoiled, so really her character is portrayed accurately. Otherwise, I think the overall message is a good one about confidence and teamwork. Suggested Retail Price: $19.99 for ages 3 and up. recyclable packaging and a solar-powered gardening set with seeds for planting. Each garden activity features a flower pot, peet pellets, two seeds packets for grass and flowers, and an innovative solar-activated character to guide light to the garden. The wings of the doll move back and forth, which displays that it is getting the right sunlight. Packaged in 100% recyclable cardboard, girls can watch their garden grow with this easy-to-use playset. My kids and I had fun planting the seeds. You have to let the water soak into the peet pellets, and that can take some time. Then, you stick the seeds into the dirt. 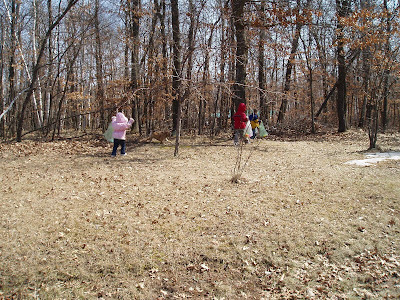 The grass grows quickly, and it was fun seeing my children's reaction to their "garden." Suggested Retail Price: $15.99 for ages: 3 and up. 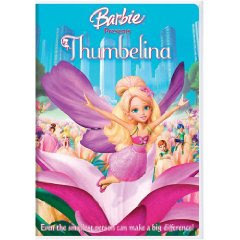 My kids really had fun playing with the Barbie Blooming Thumbelina Doll! 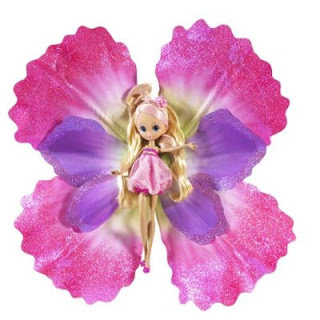 Thumbelina has her purple wings and stands inside of a pretty, glittering flower. You can pull down a button and the flower will close around her. Then, you push the button, and the petals open to see Thumbelina. Consistent with the DVDs eco-friendly theme, all packaging is made of Kraft paper and consists of 100% recyclable cardboard, and the toy line includes special instructions to girls for recycling their packaging. I really think the doll is made with quality, and I like that she can be played with without the wings and petals, too. pedestal that doubles as a wearable bracelet so girls can watch over their Twillerbaby wherever they go. Girls can also take out their Twillerbaby so they can play with her. 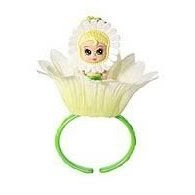 There are six different Twillerbaby flower varieties for girls to collect, including a dahlia, daisy, hydrangea, rose, sunflower and tulip. 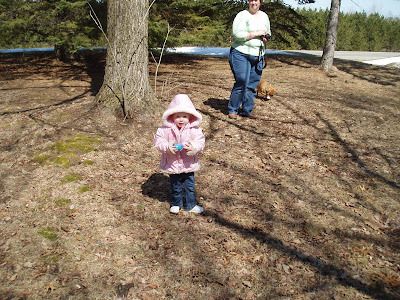 My daughter loved wearing her Twillerbaby on her wrist and taking her out to play. I think this toy would make a great stocking stuffer or a goodie bag filler for a birthday party. Of coarse, this gift would be great just because. Suggested Retail Price: $5.99 for ages 3 and up. 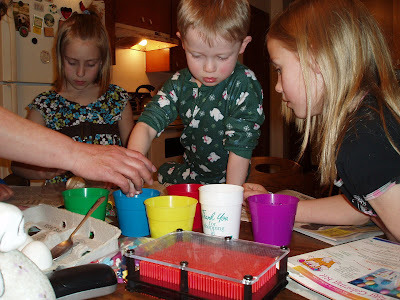 Here is a fun website that your kids can play a garden game, make a movie poster, learn how to make a flower crown and throw a Thumbelina Tea Party, get coloring sheets, and more. Kids Cards Review & giveaway! I love helping promote Mom invented products/websites! One product that I have just been introduced to is KidCards, created by an Ohio mom: Melissa Marra. KidCards are books of pre-assembled cards that kids can tear out, color, fold, and give away. Each card has an unique design for different occasions: birthdays, get well, thank you and more. There is 20 cards and 20 envelopes in each packet of KidCards. My kids loved picking out their own card to color. They had a lot of fun looking at all the different designs on the cards. The quality of the paper is great! The paper is thicker. All the paper is white, so kids can use any color to brighten it up for that special someone. KidCards also has a special Christmas edition booklet that comes with 15 pre-designed cards. I think that KidCards is a great product and fun activity to engage your child in. You kids will be encouraged to send cards to people for special occasions, and "just because" occasions. KidCards just won a 2009 iParenting Media Excellent Products Award in the Books Category, and I think that award is well deserved! What are the most positive characteristics of this book? -The best characteristic of this product is that it promotes creativity and imagination. It gives the child the chance to create something for someone else with a personal touch. 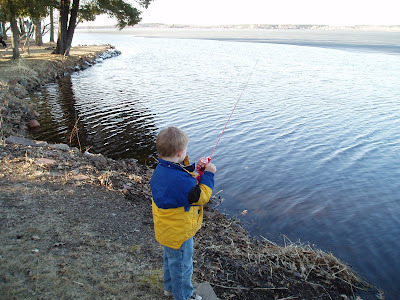 It gives a guide to work with, but allows the child to be as creative as they choose to be. -There were many choices of cards and envelopes to use with the cards. The choices were plentiful and worked well for many occasions. The spiral binding was great for flipping through the pages. -What a great way to teach children good social etiquette. With this product children learn the importance of empathy and helps them think of others on special occasions. These cards can really make a difference in someones life, especially knowing that it came from a young person. KidCards would make a great gift to give a child, and it is the gift that keeps giving. Do you want to purchase some KidCards? I was given a code to give you to give you a bonus with your purchase! When you go to KidCards, click on Buy Online, then enter the Penny Promotion Code "Blogger Bonus" in the box. When you purchase 2 or more books, you will get the crayon set AND watercolor paint set for 1 Penny! What a great bonus! 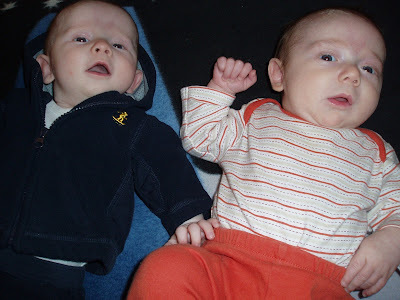 Thanks KidCards, Melissa Marra, for the review of your great products! My kids love the pre-designed cards and have fun making the cards their own. You can purchase the book at Randomhouse online. Fred Stoeker is a best-selling author of several books, including Every Young Man’s Battle and Tactics, the president of Living True Ministries, and a popular conference speaker who challenges men to become sexually pure, to reconnect in true intimate relationship with their wives, and to train their sons to become godly men. 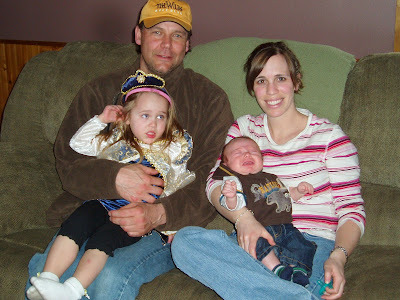 A graduate of Stanford University, Fred lives in Des Moines, Iowa with his wife, Brenda, and their children. Mike Yorkey, a writer living in Encinitas, California, has collaborated with Fred Stoeker in all his books for the Every Man’s series. Jasen Stoeker is a popular conference speaker who challenges young men to be heroic in their relationships with women and to be a Christian, rather than just seem like one. Jasen is a graduate of Iowa State University with degrees in Computer Engineering and Computer Science and now lives in Minneapolis, MN, with his wife Rose. Energizer Photo Contest (win a trip)!! Going traveling may be out of the plans this year with our economic money crunch, so people want to be creative with their summer plans. People need a new “perspective” on summer travel – the chance to look at a trip from a different “angle,” in a fresh “light” with renewed “focus” … the perfect solution: a budget-friendly photography vacation. You can make that summer trip to the zoo or the park look like a safari vacation! You can make a camping trip look like you are on an adventure! You can enter your photo sessions in the second annual “Energizer Ultimate Photo Contest” for a chance to have your photo appear in an Energizer® Ultimate Lithium ad in the venerable National Geographic Magazine!! Plus you can win a National Geographic Expedition for two to the Galapagos Islands...now that is a grand vacation! It doesn't matter if you are a top notch photographer or a grab the camera and snap that photo of your daughter with chocolate pudding all over face, all skill levels are encouraged to enter!! The contest runs until June 30 and photographers can visit nationalgeographic.com/lithium to enter a photo in one of six thematic categories: animals/wildlife, nature, travel, people and cultures, weather and inspiration/Keep Going. Go enter those photos! You have nothing to lose, but much to gain if you win! Being a SheSpeaks member, I was enrolled to try a new product from Bionorica called Sinupret for Kids. My kids, especially Madelyn, could greatly benefit from this product. SheSpeaks sent me one free sample-size bottle (1.01 fl. oz.) of Sinupret for Kids syrup, a coupon for $3.00 off the product and a small bear for my kids to enjoy. I tried Sinupret out on Madelyn, since she has been dealing with the runny nose and coughing lately. She didn't mind the taste, and just took the dose. I gave her 3-4 doses and it seemed that the Sinupret worked great for her. I didn't try the Sinupret for Kids with Caleb and Nathaniel, but I plan to use it with them, too. Sinupret for Kids is a safe, natural remedy that supports a healthy sinus, respiratory and immune function. No other clinically tested natural remedies are available in the US that supports all three functions. Sinupret and Sinupret for Kids are two of the world's leading herbal remedies for upper respiratory health for adults and children, ages 2 and up. Sinupret for Kids is available in a cherry-flavored syrup. Bionorica has given me a link to offer you a coupon to get $4.00 off of your purchase of Sinupret for Kids! Just click THIS to get your coupon. Feel free to share this link with your family and friends, too. Thanks SheSpeaks for this product review sample! Lands' End has launched The Island offering a fun and interactive new way to experience swimsuit shopping online. The sound of waves, images of cabanas and flowing waterfalls transport visitors to a private island getaway where guests can shop for Lands' End swimsuits in a fashion show runway format complete with a beautiful tropical backdrop.Visitors can enter daily for a chance to win a real island getaway for four to Barbados. 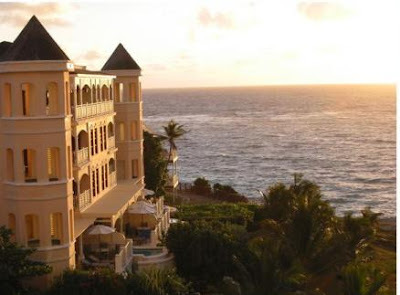 Lands' End has partnered with The Crane Resort and the Barbados Tourism Authority to give one lucky winner and three friends the ultimate island getaway vacation! Daily sweepstakes entries will be accepted at Land's End Getaway through midnight (CST) on May 31, 2009. Dr. Dolittle: Million Dollar Mutts now available! Dr. Doolittle's daughter, Maya Dolittle (Kyla Pratt), is the star in Dr. Dolittle: Million Dollar Mutts. Kyla Pratt is also in the movies Hotel for Dogs and Fat Albert. Maya is suppose to be heading off to college when Hollywood Starlet Tiffany Monaco arrives at her home to plead her services to talk with her princess Chihuahua. Maya is a life savor, not only for Tiffany's dog, but for other pet owners in Hollywood. After witnessing Maya’s natural charm and ability to communicate with animals, Tiffany introduces the gifted teen to her self-serving agent and the two persuade Maya to star in her own reality series. However, as Maya experiences the razzle-dazzle of Hollywood, her plans for college get put on the back burner. With her faithful sidekick, Lucky, by her side, Maya sees past L.A.’s rich and famous and stays true to what’s really important in her life. Her Dad taught her well! A hilarious and irresistible “tail” for the whole family, Dr. Dolittle: Million Dollar Mutts delivers a wholesome, animal-filled comedy for the entire family. Dr. Dolittle: Million Dollar Mutts arrives exclusively on Blu-ray Disc and DVD May 19th from Twentieth Century Fox Home Entertainment. The latest installment in one of Hollywood’s best loved family franchises, Dr. Dolittle: Million Dollar Mutts features star-tacular bonus materials including Tiffany’s Tricked Out Cell Phone, No Business Like Show Business and Star Tours: Dolittle Style featurettes. The DR. DOLITTLE: MILLION DOLLAR MUTTS BD includes both the BD and the standard definition DVD and will be available for the suggested retail price of $29.99 U.S. / $32.99 Canada; the DVD will be available for the suggested retail price of $22.98 U.S. / $26.98 Canada. I would like to thank all those who have lifted me up in prayer over the last few weeks. 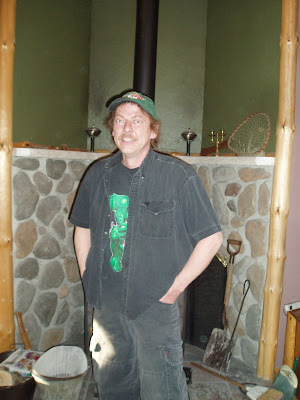 It has been quite the journey, so far, with my news of having Melanoma (skin cancer). It is a scary thing hearing that I have skin cancer. I know that my Lord has everything under control, He has a plan for me, and a plan through what I am experiencing. My surgery was scheduled for Thursday morning. I had to be there at 9:30 for preparations/paper work/tests. I had to due a urine test for pregnancy, and (Whew....) it came back negative. (not that I was worried). :) I asked them if they had to forgo surgery for people with the tests coming back a surprising positive. She said that has happened. I am glad I wasn't one of those folks. Anyway, I answered a few medical questions, took my weight, and got in my beautiful paper gown. The gown was a high-tech gown with flaps and holes. I had a hose put in one of the holes and the heat turned on. How cool is that? It was like an inside paper gown heater. Weird. Then, I got the IV inserted. The nurse put on the rubber band and slapped my hand for about 10 minutes to get the vein to pop up. I don't have veins that like to cooperate with needles. She had success with the IV, and started the fluids. Then the anesthesiologist came in to ask a few more questions. We found out we have something in common...busy family life. His wife and him are expecting #4 baby in October. The surgeon came in next and asked me more questions, and answered my questions. He also asked me if I was used to coffee in the morning, and experienced head aches if I didn't have coffee. I said that I drank about 4-5 cups every morning, even through pregnancies. So, kindly enough, they gave me 500 ml of caffeine in my IV. How sweet is that? They said they didn't want me having a nasty head ache from withdrawal. :) Hee ha...whatever works for me! I had to use the restroom one more time, and went on my way to the operating room. Can I just say I was scared out of my mind? I kept thinking of them giving me too much sleep meds and not waking back up. Crazy thought, I know, but it is one of the many things I was worried about. "I have a 10 1/2 year old, an almost 4 year old, a 2 year old, and a 4 year old. Oh wait, he isn't 4 years he is an infant. You must have given me the meds because I feel all funny now. My baby is only 4 months....." And that is all I remember. When I woke up, I was trying desperately to roll over to get off my back. They kept pushing my legs down and asked if I was alright. I told them NO, and that my back was really hurting. They asked how much on a scale, and I said an 8 or 9. I have a high pain tolerance, though. I think they gave me some morphine, because some pain was relieved. I spent about 30-45 minutes in recovery, then they put me in another room for Stage 2 recovery (sitting in a chair). I was so thirsty! I kept asking for water, and they only gave me 2 glasses. They didn't want me getting sick. I was a bit sleepy afterward, and slept on and off on the way home. I was wrapped up in a head wrap. I needed to keep on the wraps until Saturday. We stopped by my parents to give them an update. The rest of the day I rested, and ate some food. Sleeping that night wasn't too bad, just sore. I did end up nursing Cole when I got home. The meds didn't seem to bother him. He did develop a rash on his cheeks and his stomach. 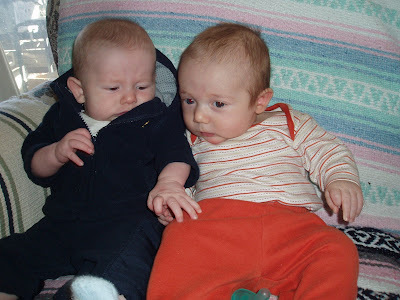 We aren't sure if that was from the 2 bottles of Enfamil, or from one of the meds I had. Fortunately, I don't think I will need to give him anymore formula. I am so glad that Cole did OK without me for those hours of surgery and recovery. I got Vicodin for pain relief, and that has been a big help. Sleeping has been interesting. I get really sore from laying just on my left side. I will post a picture of what my ear looks like now. It is really swollen, and smaller than what it was. The Surgeon took out less than what he was originally thinking. I am glad for that. He said that my ear is clear from the Melanoma now. I am so thankful! I am suppose to go back to the clinic on Wed., and he will possibly remove the stitches (if all is well). I am hoping things will heal quickly. Tonight my ear is pretty sore, but I don't have any pain meds in me yet. Thanks again for all the prayers! I ask for continued prayer for any other moles taken off to be cancer free. I also pray for quick, and beautiful healing of my ear. I will be seeing an Oncologist next week for follow up visits. Then, I will see my Dermatologist again in July. Music is such a great thing for kids to learn and enjoy! I grew up with music and instruments, and I am eager to have my kids exposed to music, instruments, and learning rhythms. Music for Kids is a great website for finding instruments for kids, of all ages. I was sent the 6 piece Rhythm kit for review, and I want to say that I was highly impressed with the quality and sound of the instruments in this kit! My kids were beyond excited to open up the kit and start in with their music making. We have already invested several hours of play with the 6 Piece Rhythm kit! Included in this kit is a hand-held drum, 2 wooden drum sticks, 2 chick-itas, bells, triangle, and a tone block. This kit is perfect for my pre-schooler and toddler to create their own band, and it came with a backpack for easy storage/clean up. We have a grand time turning on some music, grabbing our instruments and "making a joyful noise!" 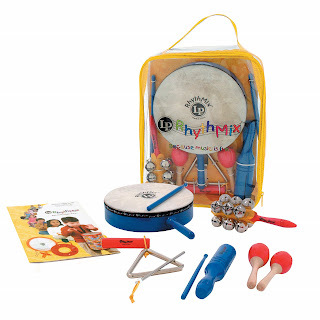 The 6 Piece Rhythm kit from Music for Kids is a stage 1 through 4 instrument in the Steps 'n Stages program. The SRP for this kit of 6 great instruments is $39.99. I think that it is well worth the investment to your child's musical fun and learning. There are several activities that you can engage with your child and their instruments found on the LP website. I would love to own all of the instruments and have my kids experience the many different types. LatinPercussion currently boasts the largest collection of percussion instruments and accessories in the world for the last 40 years. Latin Percussion started in 1964, and they are committed to bring the musician the very best percussion instruments available. Latin Percussion has offered to sponsor a giveaway! This contest is open to the USA, and will end on May 26th. Go to the Music for Kids website and find an instrument that sparks your interest! You will be amazed at how many instruments they have on their site! Come back here and comment about it. I am not going to let you know what you can win, because it is a surprise! You will be able to keep a beat with it. :) You can get extra entries by doing the extra credits, or coming back each day with a comment. Kids can have a hard time explaining or understanding their feelings. Karen Cuthrell, co-creator of Feeling Friends, authored a book to help kids with their feelings. She created this book series to help her daughter understand her feelings. Meet the Feeling Friends is a book introducing 12 feeling friends to help understand and communicate feelings. In the book, you will meet characters like Worry the Fear Worm, Flutter the shy Butterfly, and Rant the Panic Ant. Each character has a description of their emotion with a catchy song/rhyme. Meet the Feeling Friends is the first of thirteen books in the Feeling Friends series. Designed for pre- to beginning-readers, the book transports children to Feeling Free Island, a magical place where children are free to express their feelings in a world as vibrant as their own imaginations. Meet the Feeling Friends • SRP $12.99 available for purchase on Amazon.com. The remaining 12 books in the series, and a compilation audio CD of the character songs will be available in April 2009. Cuthrell presented her concept at the National Head Start Association at its 36th Annual National Training Conference in Orlando, Florida April 27-May 2, 2009. Author Karen Cuthrell (KK) co-created the Feeling Friends 15 years ago as a response to her young daughter’s challenges with expressing her feelings openly and honestly. What began as an interactive puppet show for preschoolers in the Metro DC area soon developed into a 13 book series and audio CD. KK and the Feeling Friends provides kids with the tools they’ll need to survive the big, wide world of unidentified and unexpressed feelings. In its previous live show incarnation, Cuthrell has performed live concerts, Songs of The Feeling Friends, to over 5,000 children and their families. Children sang, danced, and interacted throughout the hour-long presentation. Cuthrell’s goal is to recreate those awe-inspiring moments in books, music, and a half-hour television program. That way, this breakthrough concept will be accessible to innumerable children and families. In addition, this concept has the stamp of approval from child psychiatrist Dr. Kevin Williams and educational psychologist Dr. Kathy Philyaw, both from the Washington area, who have reviewed the materials and believe that this program will truly enrich the lives of children. My kids love Wow! Wow! Wubbzy, and they were excited to review the new Wubbzy movie: Wubbzy's BIG movie! This is a full length movie based on the animated children's series staring the energetic Wubbzy: a curious, quadratic shaped animal - as he and his friends Widgit and Walden learn important lessons about friendship and about helping others. When the cheerful Wubbzy loses his memory, his pals Widget and Walden try to help him remember who he is. To cure Wubbzy's amnesia, Widget and Walden remind their friend about many of the wacky and wonderful adventures they've shared together. Wubbzy will have to remember where to find marshmellows to make a birthday lasagna, and why splashing in mud puddles isn't always a good idea. He also sees that watching scary movies may make him afraid of the dark. My kids and I enjoy the lessons and laugh along with Wubbzy and his friends in the new collection of stories found in Wow! Wow! 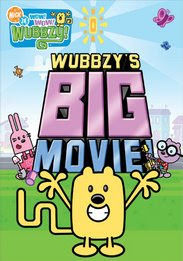 Wubbzy's Big Movie! Bonus features include: a DVD-ROM game: Sketchity Sketch Pad, activity and coloring sheets, and a bonus season 2 music video. The online world can be so fun, entertaining, educational, and very time consuming! The online world can also be filled with very shady material, evasive/suggestive material, and temptations not worth seeking out. There are online predators, questionable information, and other things demanding our children's and family's attentions. I know time limits can even be hard to follow once getting online, because you don't even realize how time flies. I am so thankful that I have the opportunity to review the great product: Spector Pro 2009 and install it on my computer. Spector Pro 2009 is a program that records every single key stroke made on my computer. I can easily track online use, e-mail use, chat/IM conversations (both conversations), get screen snapshots, websites visited, programs used, facebook/myspace usage and online searches. I like that I can monitor what is done on my computer without my child's knowledge. I can show the trust factor to them, and give them the opportunity to freely use online. I can see if they are doing anything on the computer that I don't approve of. I can also block websites and features as I see fit, too. I especially like that Spector Pro records every keystroke: passwords and user names, even!! That is a great feature, especially if you have someone that uses the computer for things that aren't honorable. I can even be notified if they use inappropriate language or visit sites I don't approve of. I really like that I can see the exact order of everything that is viewed on my computer. This works great for when we have babysitters over, too. I can see if I can trust a sitter or not, seeing what/if they use our computer. Spector Pro is the world's best selling software for monitoring and recording every detail of PC and Internet activity - in your home or in your office. Selected as the Editors' Choice by the experts at PC MagazineSpector Pro records every detail of what they do on the computer - their chats, instant messages, emails, the web sites they visit, what they search for, what they do on MySpace, the pictures they post and look at, the keystrokes they type, the programs they run and much more. And because of its advanced surveillance screen snapshot features, you get to see not only WHAT they do, but the EXACT order in which they do it, step by step. With Spector Pro, you will never doubt who is doing what on the computer. Spector Pro is installed on your computer. It records everything on and offline, but stores it in your computer. You will have to check it often, and delete what you don't want stored. It does take up some of your storage space, but you can set the settings to record at certain times, and you can delete how ever often you want. No one knows that Spector Pro is installed on your computer: it does not show up as an icon, does not appear in the Windows system tray, does not appear in Windows Programs, does not show up in the Windows task list, and it cannot be uninstalled without the Spector Pro password which YOU specify. I feel much safer with Spector Pro 2009 installed on our computer, and I think there is more accountability knowing it is there keeping tabs on what we do. Spector Pro is available now for immediate electronic download. Using the secure server, you can purchase, download, install and begin using Spector Pro in less than 5 minutes, even if you download using a dial-up connection! Click here to purchase and download Spector Pro now. Spector Pro 2009 is regularly $169.95, but on sale now for $99.95. Jewelry can be so fun, especially when you can "create and change" it up yourself a bit! 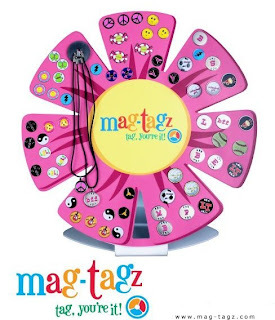 A new jewelry line, mom invented, called Mag Tagz gives girls interchangeable options for creating the look they want. I was sent a Mag-Tagz necklace to review, as well as the Bee Tagz, which is one of the "limited edition" Tagz, that were created by Lauren. The other limited edition Tagz is a Green Earth Flower Tagz, designed by Lauren's friend, Connor. I think that the Bee Tagz is very cute, and the Tagz holds firmly on the base (circle with a sun) on the necklace. I didn't have to worry about losing the Tagz. I know this would make a great gift for a young girl, and she would have a great time giggling, sharing and trading with her friends over the different Tagz to put on the necklace. I like that the Mag-Tagz company promotes creativity and artistic opportunities. Anyone can create a Tagz, and send in the design. If Mag-Tagz likes and chooses the design, it will become a "limited edition" Tagz. Not only is your design showcased, your name is engraved on the back! How cool is that? I thought it was fun to put the Bee on the magnetized necklace, for a fun look, or take it off to show the circle with a sun. There is something so amazing and fun with magnets. Plus, with so many options to chose different tagz, this product makes for a great opportunity for friends to have a connection and way to have fun. I checked out the game that Mag-tagz offers on their site.... “Tag, You’re It!” There are codes on the back of the Tagz, and you need to enter your code. (You can get more codes when you share the Tagz, trade them, or find new friends that own Tagz). When you enter your code, you get a clue. After 4 clues, you figure out how they relate, then enter your answer on the Contact Us page. Right now, you have until August 15, 2009 to play the game, and have a chance to win a Nintendo Wii! Not only will you get a chance to win the Wii, you will get a special-edition tag just for participating. Mag-tagz are most fitting for any girl age 5+. Mag-Tagz is offering one of my readers the chance to win one of the limited edition tagz! You can choose either the bee or green earth with a necklace, too! Three new movies from Lionsgate! Kids everywhere are going to be thrilled with the release of HIT Entertainment's and Lionsgate's three new DVD's May 19th! All three DVD's are great for small children to enjoy and teach good lessons. Fireman Sam is a fire fighter who teaches children the importance of fire safety. 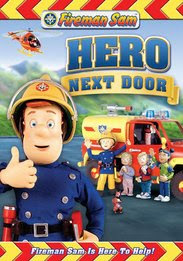 I really like the new Fireman Sam video Hero Next Door, because Sam helps kids know how to avoid accidents and how to work together. Set in the village of Pontypandy, Sam and his trusty fire brigade race to the rescue with practical lessons in dealing with fires, rescuing trapped children from a cave or learning about conserving water. Sam is everyone's Hero Next Door! Fireman Sam – the only firefighter-themed children’s show – originally launched in the UK and made its U.S. debut on PBS KIDS Sprout in October 2006, and continues to air daily. Fireman Sam is on the scene for more heroic adventures in five fun-filled episodes for the whole family! Team up with Sam and his fire-fighting crew as they teach that safety comes first with lessons about the dangers of fire and tackling challenges big and small. So be prepared and come along for four-alarm fun with your favorite hero next door, Fireman Sam. Barney's Let's Go on Vacation is a great video with Barney and his friends traveling to Mexico!Barney displays sharing, caring, imagining, dancing and learning on television, online and through live events, home entertainment and publishing. The Emmy award-winning series, Barney and Friends changed the face of children’s programming when it first launched and continues to be one of the top-rated preschool shows today, airing on PBS KIDS and PBS KIDS Sprout. Pack your bags and embark on a dino-mite musical vacation discovering a whole new world of fun when Barney: Let’s Go On Vacation travels to Mexico. Featuring fun stories never-before-seen on TV, Barney, Baby Bop, B.J. Riff and playground friend Emma travel to Mexico (via their imaginations and the Travel Book) where they meet new amigos Fernan and Amalita. Together they sample Mexican foods, have a lesson in Spanish and enjoy a pinata party. The trip ultimately turns into a singing and dancing celebration of the differences and similarities between cultures and the group quickly learns that the things that matter most – family and friends –­ are the same the world over. · Pack a Suitcase with Barney - Help Barney decide what to bring for his upcoming vacation! The beloved animated children’s series, Thomas & Friends, has a new look, new engine friends and a new live-action host, Mr. Arkwright, waiting with a warm smile and a tip of the hat to welcome you to the Island of Sodor. Teaching timeless life lessons such as friendship, cooperation and respect for others, Thomas & Friends invites children to enter a world of imagination through the tracks of a train and the words of a story. Thomas & Friends: Team Up With Thomas is the only DVD is the new host, Mr. Arkwright, which is a new driver on the Island of Sodor. Mr. Arkwright is Sir Topham Hatt’s right-hand man, and engages children with interactive dialogue and extra fun, like showing how to build a cardboard engine for Sir Topham Hatt’s grandchildren. As an added bonus, Lionsgate and HIT Entertainment are also releasing a special limited edition of Thomas & Friends: Team Up With Thomas packaged with a Thomas Wooden Railway engine. Everyone’s favorite true blue engine, Thomas, is back with friends old and new in four fun adventures on the Island of Sodor in Thomas & Friends: Team Up With Thomas. This DVD is enhanced with state-of-the-art CG animation and a new live-action host, Mr. Arkwright, who welcomes viewers with a smile and a fun project for Lady Hatt’s grandchildren. Thomas, Edward, Toby, James and the rest of the engines introduce young engineers to Hank, a big, strong, new engine, and Flora, a lovely new lady steam engine. Together, they take us along on their tasks around the island. Be careful: trouble may lie around the next bend. But one thing’s for certain – you’ll always come home with a brand new friend! “Heave Ho Thomas” – Sir Topham Hatt asks Thomas to show Hank, the new engine, around the island. Thomas quickly rails against Hank’s brash personality and refuses to let Hank help him with his important jobs. When overloaded, Thomas cracks a cylinder and needs Hank’s help. The two soon become good friends. “James Works it Out” – It’s winter on the island and James is telling everyone he always knows best and never needs advice from anyone! When Hector tries to warn him about the bad weather, he decides to ignore him. He soon changes his mind when they get stuck in the snow. Luckily, Hector is happy to help his friend James. “Tram Trouble” – Toby is very excited about leading the parade at the first Great Waterton festival, so when Thomas discovers that Flora, the new steam tram, is also leading the parade, Thomas is worried his friend will be upset. Thomas tries to impede the forthcoming events…little does he know that Toby is scared of leading the parade on his own! “Push Me Pull You” – The Puppet Show has arrived on the Island of Sodor and Skarloey excitedly asks Sir Topham Hatt if he can pull the puppet show special. The trucks are very heavy, and instead of accepting Rheneas’ offer of help, Skarloey challenges him to a tug of war with the trucks. Disaster quickly ensues, and Skarloey learns that friendship is the strongest thing of all. What an honor and acknowledgement when another blogger seeks you out, and not only reads your blog...but features you specifically on their site! Thanks goes out to Womb to Bloom for featuring my site in their top 5 pick for the week! Thank you so much for the kind words and the "research" you have done on my site. I feel it a high honor. 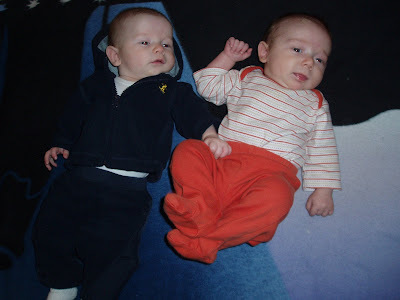 Cole is 10 days older than his little cousin, Isaiah! 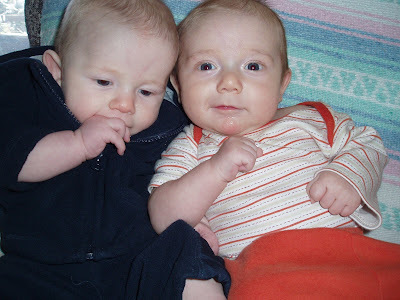 It is so fun to have two little boys in the family that are only 10 days apart. My parents were watching my brother and sister-in-law's kids one day about a month ago, and I brought the kids over for a play date. So, of coarse I had to bring my camera to snap a few photos. 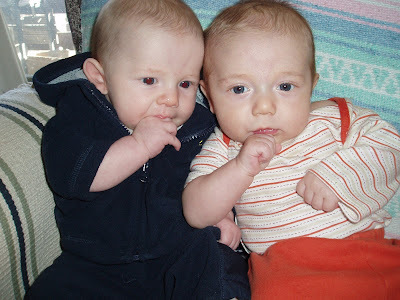 They both love to chew on their hands. Aren't they handsome little fellas? I even got Isaiah to give me a little smirk. He looks a lot like my brother in this photo. 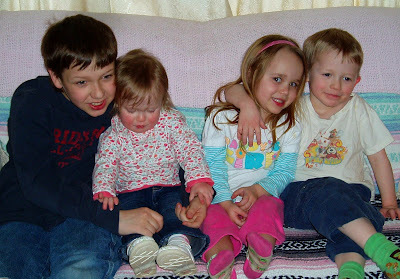 Here is Nathaniel, Madelyn, Atira (Isaiah's older sister who is one year younger than Caleb) and Caleb. Caleb and Atira are the ring bearer and flower girl in my other brother's wedding this summer, along with my other niece as a flower girl. 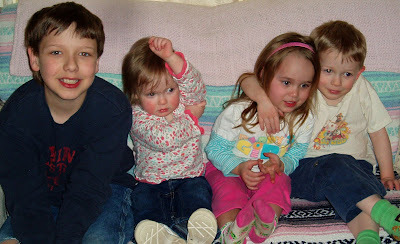 Another adorable shot of the four kiddos. Caleb and Atira are buds. We live a little over an hour from each other so we don't get together too much. Not enough actually. How cute is this? I love this photo! I love how Cole reached over and grabbed Isaiah's hand. Isaiah wanted to keep his legs scrunched up the whole time. It would have been fun to see the length difference in the two. What an expression of my little boy! 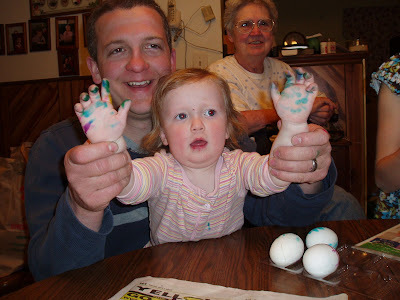 Madelyn had a blast decorating the eggs with colored Q-tips. 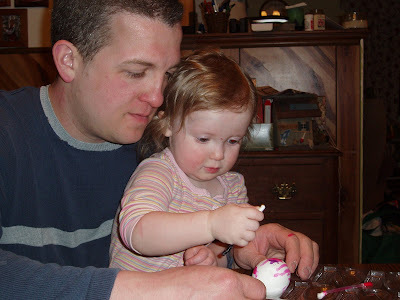 This is a genius way for tots to color eggs! Less mess, and loads of fun! Caleb got into the coloring, too. 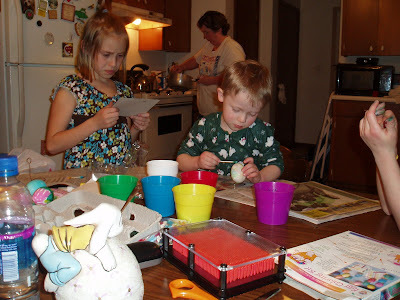 Two of his cousins were there coloring eggs, too. Kendra and Chelsea are their names. Them and Madelyn are the ONLY great granddaughters for Terry's Grandma. 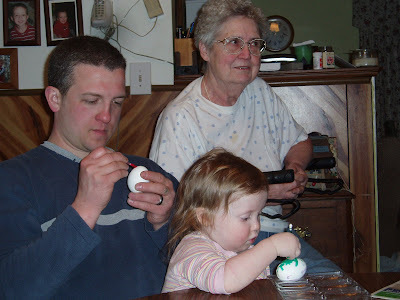 Terry had a great time coloring eggs, too! 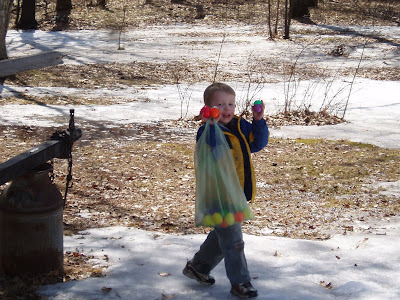 The next afternoon, we had an egg hunt in the yard. Tons of eggs. I am sure more will be found this summer. Caleb loved the hunt, and made a good killin'. 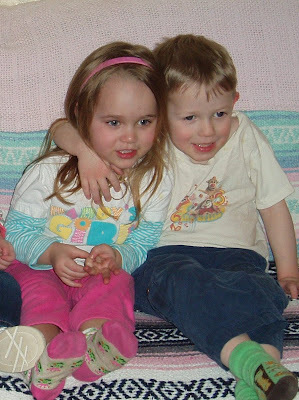 Look how little Maddie looks. She had a great time this year getting more involved. We spent some of our weekend going to my brother's house. I got a few family photos of my brother's and their families. 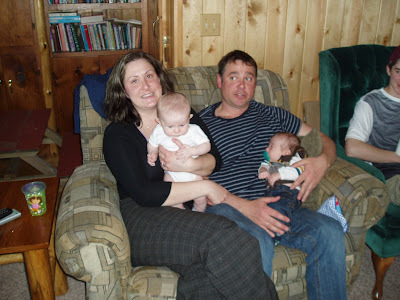 This is my brother Kevin and his family. 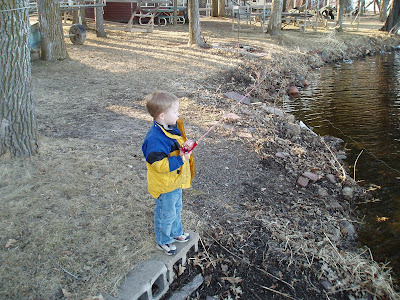 Caleb really loved "fishing" with Atira's pole. He didn't mind whether it was in the water, or over the deck. Of coarse in the water is more realistic. This is my oldest brother, Tim. 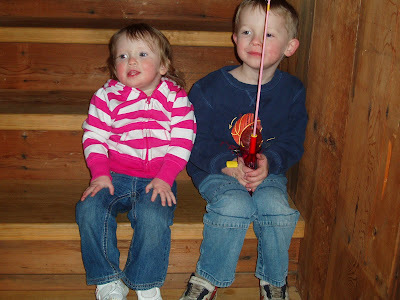 Caleb and Maddie had a great time with their cousins. This is my brother, David and his family. And this is my brother, Russell with his fiance. They are getting married next month! They are holding Cole and Isaiah. I hope they will have a few of their own someday. 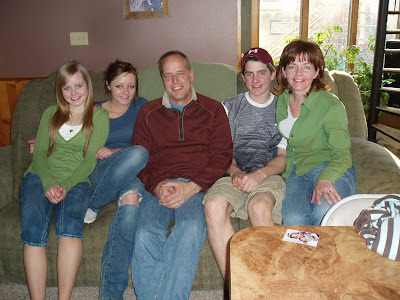 :) My brother Russell has two daughters (a senior and a sophmore). Want a Chance to go to BlogHer? And Win?? 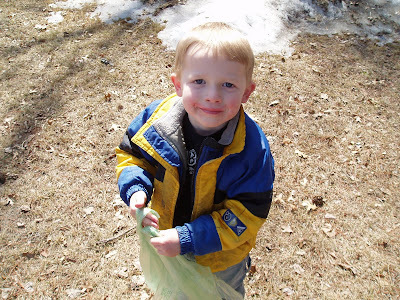 Fighting allergies with 3M Filtrete's help! Finding "me" time with Frigidaire!